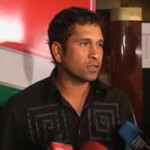 The Cricket Legend Sachin Tendulkar passed his 15000 runs as India chasing a score of 227 to beat South Africa in the second ODI in Belfast. He took 5 runs( 1 + 4 overthrow) on Andre Nel’s last ball of the over, but before that he hit 160th six of his ODI career in the 4th ball of the same over. I was expecting Sachin to complete his 15000 runs with a bang, but it was completely opposite, Anti Climax of 5 runs through overthrow. i need whole record from 1989 to 2007 of Sachin Tendulkar in Table. Every year should be recorded.